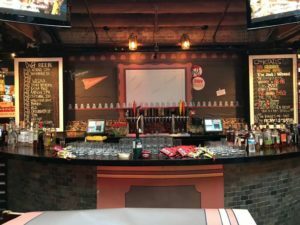 (Centennial, CO – May 17, 2018) – SpeedPro Imaging, the nation’s leading large-format franchise, was featured by several prominent national publications as the premier thought leader on experiential graphics. The phenomenon that is experiential graphics (or, environmental graphics) is sweeping across America, and SpeedPro Imaging is leading the charge. Experiential graphic design incorporates traditional, technological and form graphics with the surrounding environment to convey a message or enhance an experience. Q1 2018’s “Experiential Graphics” PR campaign provided local studio owners across the country an opportunity to highlight their work in a wide variety of settings. Each SpeedPro Imaging studio owner shared the high return on investment and “wow” factor enjoyed by their clients. SpeedPro Imaging Marin studio owner Steve Moran-Cassese was featured in Sign Builder Illustrated’s “Into the Woods with Environmental Branding” article. 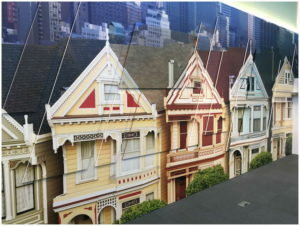 Moran-Cassese assisted in the massive rebranding of Hewlett Packard’s Worldwide Headquarters in Palo Alto, California. Moran-Cassese, a long-time proponent of experiential graphics, says it’s the fastest-growing sector in wide format. 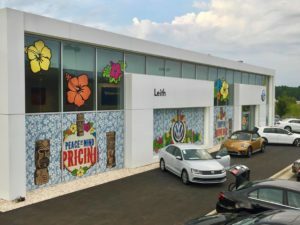 Transforming a bland and lackluster dealership showroom into a vibrant, Polynesian beach-themed landscape resulted in two major profiles for Mark Simmons, studio owner of SpeedPro Imaging Apex, NC. Simmons was featured in Sign Builder Illustrated’s article “Environmental Graphics: Just Like Paradise” and Sign & Digital Graphics’ “Featured Project: Bringing the South Pacific to Carolina.” Simmons came up with the idea, the company trusted his branding vision and the rest is history. SpeedPro Imaging CEO Larry Oberly is thrilled to see these studio owners receive the national recognition they have worked hard to deserve. Oberly says he’s proud of their amazing work and says its representative of the capabilities all SpeedPro Imaging franchisees possess. SpeedPro Imaging is the nation’s leading business-to-business printing and graphics franchise. Providing visual communications solutions to all industries since 1992, SpeedPro Imaging specializes in high-quality wall murals, event graphics, tradeshow displays, vehicle wraps, window graphics, and other wide-format products. Today, there are more than 135 studios open and in development in 32 states.